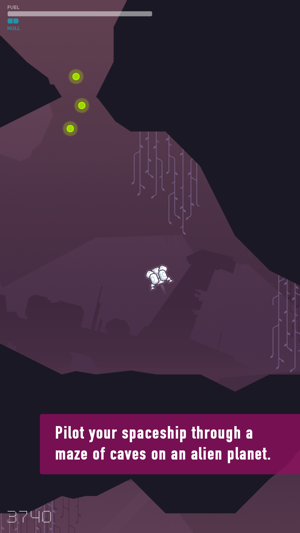 Pilot your spaceship through a maze of caves on an alien planet. Try to reach the surface, while collecting luminum crystals which you can trade for upgrades. Watch out for hazards like mines or laser batteries, and keep an eye on your limited fuel supply. 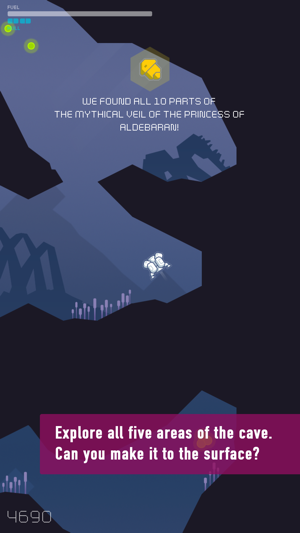 Cavernaut is a cave flyer with its roots in classic arcade titles like Lunar Lander, reinvented for the iPhone and iPad: You steer your ship with simple touch and tilt controls through a cave that is randomly generated for every game. 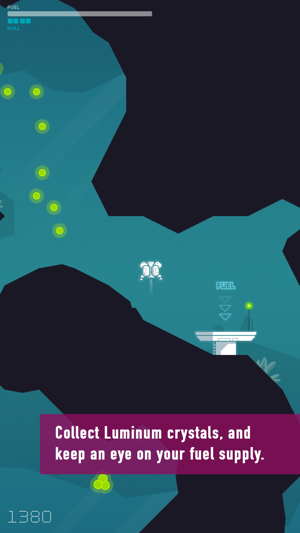 Each time you play, there's a new path through the caves, and all the items and landing pads are in different places. "... it all comes together into a tense, surprisingly strategic experience"
"Cavernaut proves to be quite challenging yet satisfying." 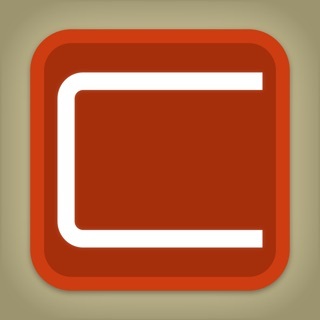 "A perfect coffee break title that has the addictive components of games from the old days." 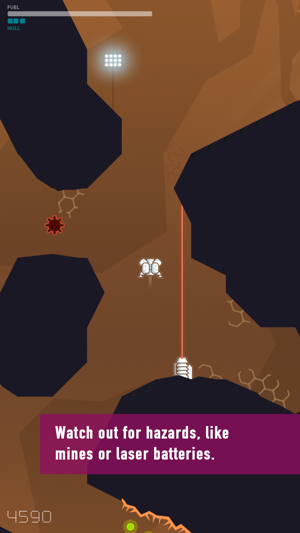 "With simple but addictive mechanics and a very efficient control system, Cavernaut is a small but truly enjoyable mobile game." >>>>> Always running out of fuel? Collect luminum crystals, the universal currency in this part of the galaxy, and use them to buy a bigger fuel tank for your ship. Or reinforced hull armor, better shields – *anything* will increase your odds for success in a place like this. But there's more to discover: You can find pieces of alien relics that are scattered throughout the caves. Collect all parts of a relic to add it to your collection of precious artifacts. Now that's something to brag about in the orbit terminal's bar! >>>>> No in-app purchases. Ever. 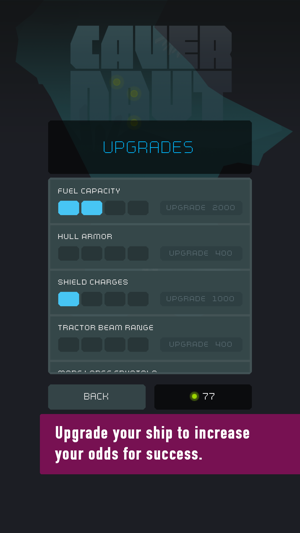 Pay once, play as much as you like, all future upgrades included. 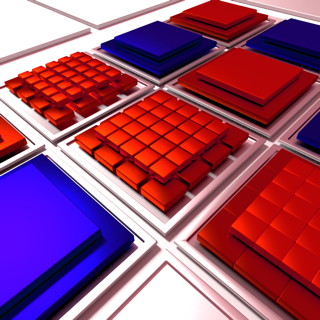 No free-to-play mechanics, just old-school gaming. 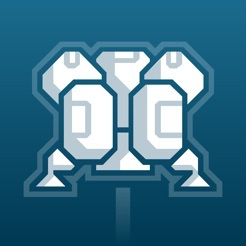 Have fun playing, and please leave a rating at the App Store if you are enjoying Cavernaut! Over eight years of buying/playing iOS games. There are certainly more feature-rich games out there, but the simplicity of this one draws me in and I keep coming back to play. I have no bad thing to say about this app. Nothing I'd change at all. I'm not sure it's ever happened I couldn't at least suggest a change or addition etc. Retro feel done right. For when you aren’t situated to be leaning left and right. Kind of a big deal for me and would love to suggest this to others but can’t without better control option. Also been abandoned by the dev but that wouldn’t be a big deal if they spent some time updating the controls.